The temple is open from 8.00 a.m. to 11.00 a.m. and 5.00 p.m. to 7.30 p.m. 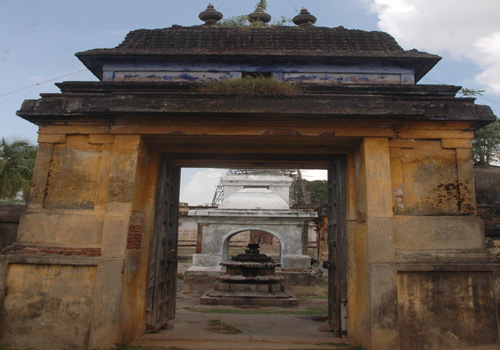 The visitors are advised to contact the temple administration in advance. 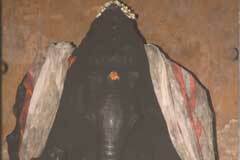 A king ruling this region then, prayed to Lord Shiva for child boon and performed a yajna. Through His voice, Lord assured the king that Ambica would be his daughter. When the king set out on hunting, he found four female children, brought up them as his own daughters. They were Shiva devotees by their very nature. When they attained age, king begged Lord to marry them. Lord was happy to grant king’s wish. 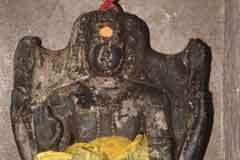 They are the Ambicas in four places – Sarivar Kuzhali in this temple, Vaaitha Tirukuzshal Nayaki in Tiruchengattangudi, Karundhar Kuzhali in Tirupugalur and Vandar Kuzhali in Tirumarugal. They also bear the common name Shoolikambal as they helped a poor pregnant woman deliver her child during absence of her mother who was stuck at the other bank of the river due to heavy floods. Shool or Karu in Tamil means pregnancy. 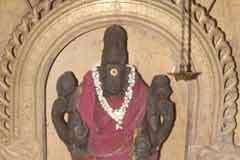 Karu Katha Ambica is other name of the Mother in the temple. As Ambicas returned late, they could not enter the temple. Mother shrines are outside temples in these four places. During the Arthajama pujas (final night pujas) samba rice with pepper, seeragam, salt and ghee is offered as nivedhana, a diet prescribed for mothers after delivery. 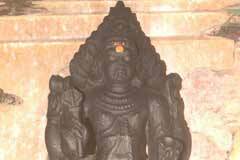 Lord Somaskanda has a special significance in the temple. 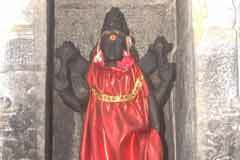 The idol shows Ambica pulling the Nandhi to a side to enable Lord Sri Rama worship Lord Shiva. As special pujas are performed in Lord Sri Rama temples on Punarvasu Star days (Punarvasu is Sri Rama’s birth star), this puja is performed to Lord Shiva too on this day as Rama worshipped Shiva here. 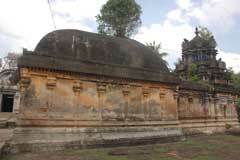 It is the belief even now that Sri Rama performs the evening puja to Shiva daily here. Devotees consider this darshan very important. Lord Subramania blesses from a separate shrine with a flower on His left hand and blessing devotees by the right. In Tiruchendur Lord Muruga holds the flower in His right hand. 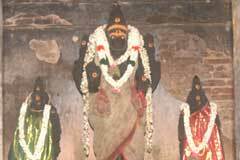 Lord Muruga graces devotees with His consorts Valli and Deivanai. 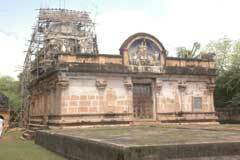 As Lord Rama worshipped Lord Shiva here, the place is named Ramanatheeswaram. As Nandhi hid the Lord, the place is also named Rama Nandeeswaram. 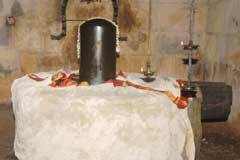 During the Aarati to Lord Shiva we may notice a Jyoti light on the Linga. Miracle Based: Lord is Swambumoorthy here.